Are The Doctor and Clara about to get romantic? Star Peter Capaldi says no, but they will if Doctor Who showrunner Steven Moffat has his say. 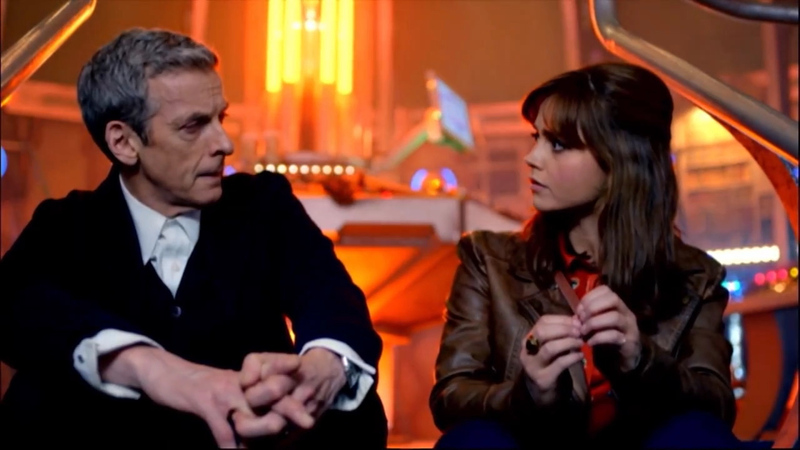 The Doctor (Peter Capaldi) was never meant to fall in love with the Impossible Girl, Clara Oswald (Jenna Coleman). However, if Steven Moffat has anything to say about it (and he’s the man with the pen, so he has lots to say), then they may compromise their friendship for the sake of romance. This is bad news for Capaldi, who made it very clear when he boarded the TARDIS he wanted to leave the romance between The Doctor and his companions behind. More: What about Danny Pink? Feel free to join me in a round of “Seriously, Moffat?” The Doctor does love Clara, just as he has loved all of his companions. This does not mean there needs to be sexual tension brewing between Capaldi and Coleman. It definitely does not mean the Doctor is secretly pining for Clara. They are friends and fellow travelers; to suggest something more is… well, tired. Isn’t the Doctor still married to River Song, anyway? Or has Moffat forgotten his own romantic contribution to the series. Hopefully, Season 9 will keep the focus on Clara and the Doctor’s beautiful friendship and leave romantic love out of the equation. Capaldi is on point: The Doctor does not need to fall in love with all of his companions and both characters have more important things to do than steam up the TARDIS, no matter what Moffat may think.